Birdwatching is one of the most popular leisure activities in the world, especially when done in a group. If you’re interested and are in Ibadan, Oyo State, Nigeria, why not join us? Read on for details……. The Ibadan Bird Club was started on 5 March 2014 by the Nigerian Conservation Foundation (NCF) in partnership with the University of Ibadan (UI) and the Forest Project at the International Institute of Tropical Agriculture (IITA), with funding from the African Bird Club. The aim was to exchange ideas and share knowledge about birds, and get actively involved in the conservation of birds and biodiversity. After a very promising start in 2014, a decision was made to re-launch it this year as part of the IITA Forest Unit Ornithological Monitoring Project, which is funded by the A. P. Leventis Foundation for 2016 and 2017. This should give it a better base from which to watch a huge diversity of birds in a safe and inspiring location. The re-launch took place in the beautiful IITA Forest Unit Ethnobotanical Garden on Saturday 13th February at 3:30 pm. There was a great turn-out - 30 adults (22 male and 8 female) and 6 children – which included IITA staff and families, members of the UI Zoological Gardens and Department of Wildlife Management, organisers of the Forest Unit Schools Conservation Clubs, and visitors to the IITA hotel. Forest Unit head, Deni Bown, welcomed members, introduced everyone and explained about the Ornithological Monitoring Project and its activities. 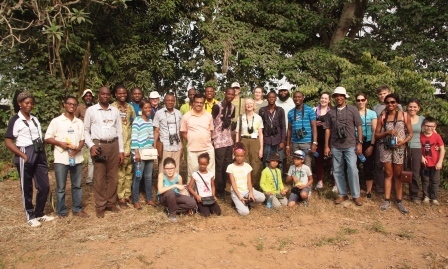 There was then a group photo before the group divided into two, led by ornithologists Dr Taiye Adeyanju (UI) and Wale Awoyemi (Forest Unit). The field session began with group leaders demonstrating how to use binoculars and explaining the basics of bird identification. One highlight of the expedition was the interest shown by the children, the youngest of whom were age 7. They were so keen and most had their own copies of the guidebook “Common Birds of IITA”. By the end of the afternoon they were able to identify up to seven birds and impressed us all, especially their parents, with their love for birds. This is promising as the saying goes “catch them young”! 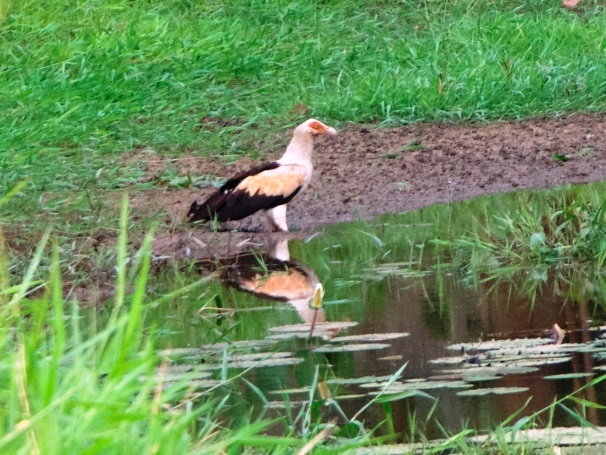 Another highlight was a Palm-nut Vulture as it flew from where it was perched on a silk-cotton tree to the lakeside to drink. It was there for up to five minutes, allowing the group, especially the children, to watch and take photographs. Other species recorded during the expedition included African Jacana, White-headed Lapwing, Spur-winged Lapwing, Broad-billed Roller, Little Bittern, Black-headed Heron, White-faced Whistling Duck, Red-eyed Dove, Pied Crow, Purple Heron, Yellow-billed Kite, African Pied Hornbill, Squacco Heron, Intermediate Egret, Wood Sandpiper, African Grey Hornbill, Woodland Kingfisher, and a Long-tailed Cormorant drying its wings. The expedition ended at 6:00pm. If you’re interested in birds, or would like to learn, you and your family and friends are most welcome to join the Ibadan Bird Club and watch amazing birds in one of the best places in Nigeria. We meet on the last Saturday of the month and membership is free! For more info please contact Deni D.Bown@cgiar.org or Wale A.Awoyemi@cgiar.org. IITA Reforestation Project. Simple theme. Powered by Blogger.